Well it is Sunday, and I have spent some time working on my book because my writing coach is relentless so I am little tapped out when it comes to coming up with a great post today. I thought I would just share an awesome picture I ran across on Facebook. I don't know if you know this but people post a lot of pictures on there. 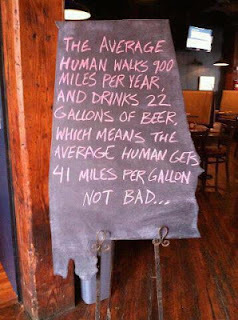 Plus, I am also going to do my best to make sure my miles per gallon is at least average as I will be rooting on my soccer team as they start their season and you have to kick off the season with a few adult beverages. First I have to watch "The Amazing Race" with the amazing Mrs. Shife and root for the hockey players. Anyone else watch it? That is my Sunday evening and it shall be grand. Hope yours is too. I drank 3 shots of Rumplemintz last night and sang one karaoke song. 3 ounces a song is good mileage too. Huh? I drank some diet cherry 7-up, baked some of what I have dubbed 'coconut crapshoot' cookies (not too shabby) then baked chicken for this week's lunches and cooked a taco dinner. Life is good. really like the hockey players, the dude with the creepy smile is kind of a tool. That's great stuff! Math can be fun. Good luck with your writing (editing)!